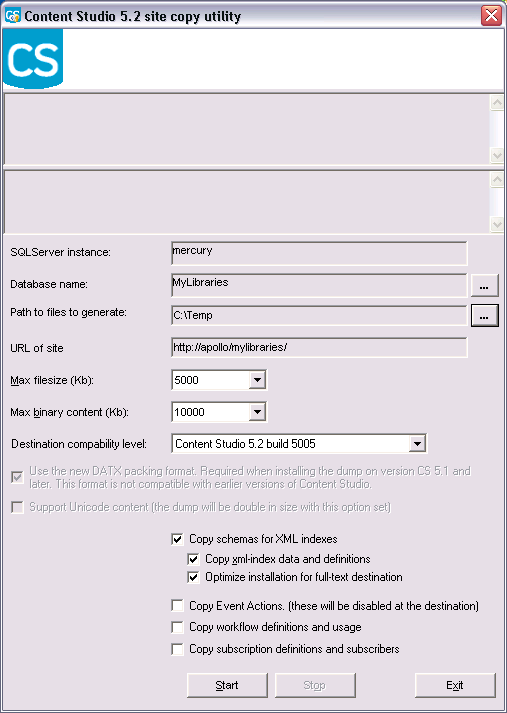 In Content Studio it is possible to dump a site to .DATX - files that can be used when installing a new Content Studio site. This makes it possible for a developer to build the customer's site on a development machine and install it via the Content Studio installation program. Site dumps can also be used as backup and has the advantage over regular SQL-server database backups in that that they are far more easy to restore on a new server. They are of course not a replacement for daily backups particulary not for sites with a lot of security set. The Site Exporter does not export any user or group information and no security information. To create a site dump you log on to the Content Studio server and you must have access to the SQL-server installation that drives the Content Studio site to be dumped. Before running the site dump you must know the name of the SQL-server database that contains the site to dump. Between different versions of Content Studio new features are added to the product and by setting the compatibility level you adjust the data exported to the version of Content Studio where it gets installed. For example; you can down grade a site from version 5.2 (the current installation) to version 5.1 (the destination) by setting the compatibility level to Content Studio 5.1 and no features and data that does not exist in the earlier version gets exported. If you set the compatibility level to a value too high for the destination the installation of the web site will fail. If you try to dump a site database used with an older version of the product and you set the compatibility level to a higher value that the source, the Site Export utility will fail. When Content Studio introduced native 64-bit support the older DAT packing format become outdated. Instead a far more effective packing format DATX was introduced. For older versions of the product DATX cannot be used and for that reason Site Copy utility continues to support the older format but only if the destination is an older version. On 32-bit computers the Content Studio installation program can still read the older DAT format making it is possible to export an older site to a later version of the product. Support Unicode content: This option allows you to preserve documents that have Unicode content ex. Chineese or Korean. Since the site dump will be stored as Unicode the .DAT-files will be double in size and this will also effect performance of the installation. Thus, you should only set this option if your site contains Unicode data. This option is not used with the new DATX format since these dumps are fully Unicode by default. When this option is set a command that turns off the automatic background population of fulltext indexes during site installation and Sql server the does not have to index any documents during installation. This option was added in version 5.2. When this option is selected all Subscription Services related information and subscribers. Only available when Destination compability level is Content Studio 5.2 and later. Documents Always, except for system documents (id < 1000).